This is the story of an incredible recipe for outrageous brownies. But let’s take baby steps. Over a year ago I saw a recipe for caveman brownies on Pinterest made with sweet potatoes. One that was pinned quite a lot. I was intrigued, so I printed it out and waited for the right time to bake them. Unfortunately that time never came; and the print-out got lost in one of the stacks of papers that are precariously placed around my room. But just as the One Ring in the Lord of The Rings, the recipe waited to reveal itself to me just when I needed: Yesterday. You see, I’m drastically cutting on sugars this week (I’m trying to lower my body fat to 6%-8% to get ready for a triathlon I’m competing in next Saturday). I do struggle though. I’ve always been one of those people that needs something sweet after lunch and dinner. It’s doesn’t have to be fancy, just something to satisfy my sweet tooth and stop it from nagging me. But when I cut sugar, sticking to just a small, sweet snack is tricky. Once you bite into something delicious, how to stop? Well, you get it. 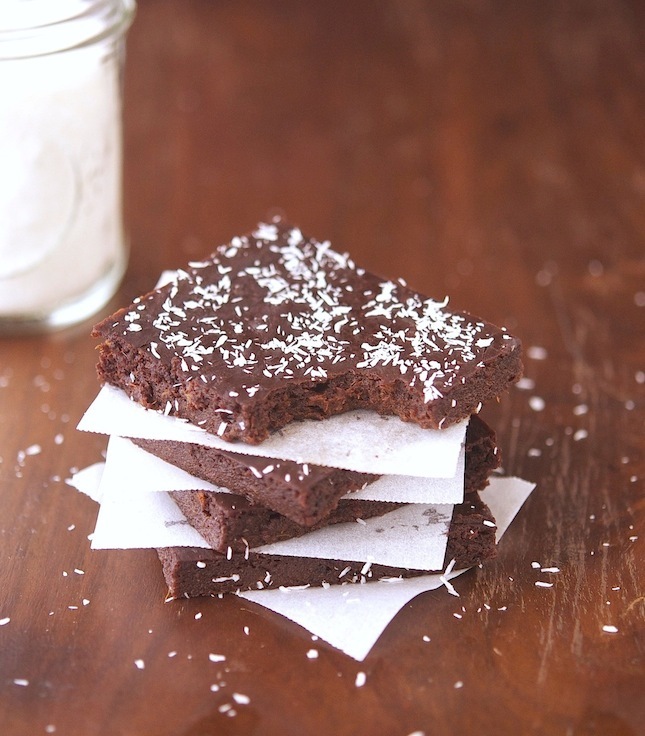 That’s when these sweet potato paleo brownies come into play. They satisfy my sweet tooth and they’re the epitome of healthy. Packed with superfoods, very low in calories and very, very low in carbs. But the best part is that they taste amazing. 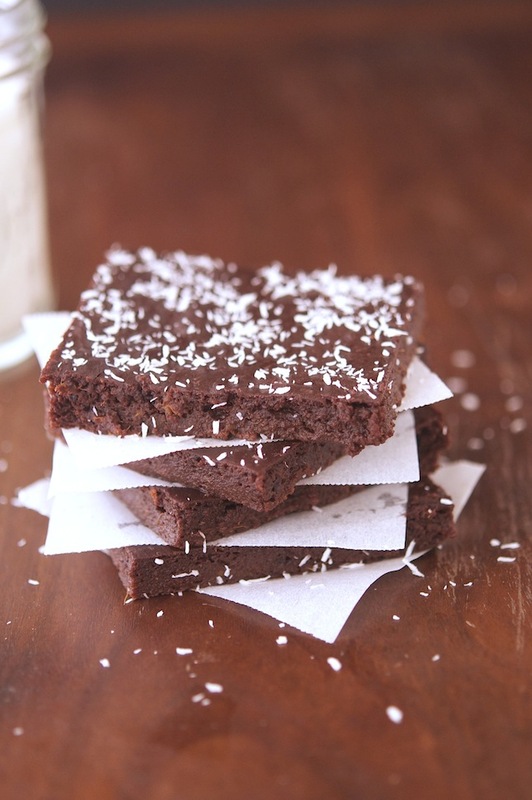 Seriously they are the ultimate melt in your mouth brownies. For some reason I can’t explain, the sweet potatoes enhance the flavor of chocolate. So what you’ll get in the end are moist and super-chocolatey brownies. But that’s not it, baking these brownies is not so daunting, a couple of ingredients that you can get at any grocery store. Totally do-able. Trust. Sweet Potato Paleo Brownies Print this recipe! Place a rack in the upper third of the oven and preheat oven to 325°F (160°C). Grease with coconut oil a 9×13-inch baking pan. Line the pan with foil and grease the foil. This will make brownie removal much easier. Whisk together cocoa, coconut flour, baking soda and salt and set aside. Let cool and cut into 16 squares. If you’re like me, you will prefer brownies cold. But I bet you’re normal and will just eat them hot from the pan. 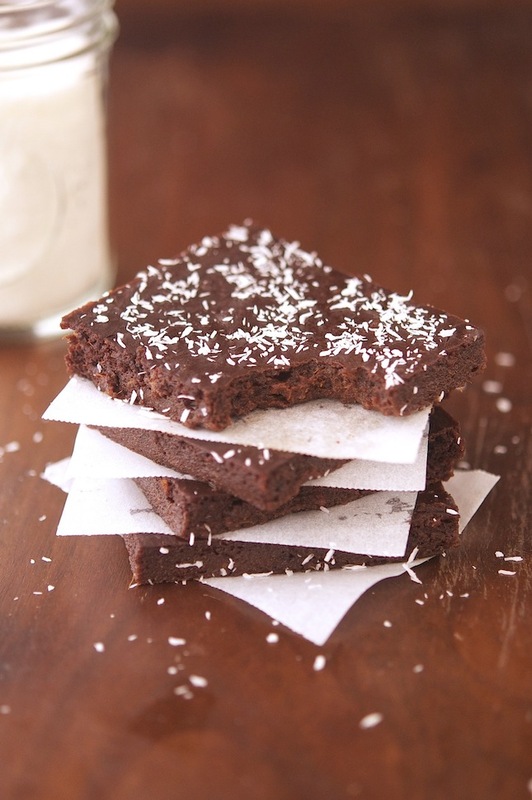 If desired, dust the brownies with coconut flour. One brownie scores 102 calories, 5.1 grams of fat, 11.9 grams of carbs and 2.4 grams of protein. I am drooling, I put this at the top of my recipe list. I need to try these! Thanks for the post! Thank YOU Kristin for the awesome comment! Man, that's gotta be hard to achieve. But why do you have to get so low right before such a demanding event? Do you find it helps you perform better? One thing for sure ,there ain't gonna be anything that wiggles on that body of yours. Hey, good luck with the triathlon my friend. I'll be cheering for you all the way from Quebec, Canada! It's not that hard to achieve if you start from 10%-11% (where I'm at now). In triathlon, body fat percentage is crucial, as it greatly impacts on your overall VO2 capacity. Without going into too much detail, let's say that the less body fat you carry around the faster you go and the less effort you make. Anyway, thank you for rooting for me I'll let you know how that goes! Well, let me tell you, I have nothing but admiration for you and what you are doing. They are dangerous TAM, too good to pass up. Good thing they're so healthy! Dude, you didn't bring any of these to swim practice yesterday. Shame on you! Are there any substitutes for coconut flour? These sound delicious but I don't have coconut flour. Could I use almond flour instead? I have such a sweet tooth as well. Thanks for sharing this healthful recipe I look forward to trying it! I know, right? It's incredible how sweet (and moist) there brownies are. I still can't believe myself! How much is a medium sweet potato? We get them here that weigh pounds also ones that weigh a few ounces, somewhere between is medium, but where? The nutrition info would be out if using way too little or much also affect how recipe turns out. Thanks for what looks to be a great recipe, sorry for nit picking! A medium sweet potato weighs about 4 to 5 ounces. That's the size I used for this recipe btw. Sorry- I have the same question but I'm dense.....so a total of 8-10oz of raw or cooked sweet potato? Sorry- I'm dense. Is this raw or boiled weight? Thanks for that info, I would have used way too much sweet potato! I'm making these right now for a neighborhood function tonight. I'm wondering how the kids will respond to them. I opted to swap the honey for pure maple syrup and added a handful of pecans and a light dust of cinnamon; thought that might complement the sweet potato. The house smells wonderful and I can't wait to eat one! Kids are such a tough crowd to please, but adding pecans and cinnamon, was definitely a smart move, Kudos! Finger crossed and do let me know how people like them. I am so trying this ASAP.